We Americans really, really love popcorn; every year, in fact, we chomp down a billion pounds of popped kernels. It's no surprise that much of that is eaten in movie theaters, but it may surprise that some 70 percent is made and snarfed at home. Pretty much everyone loves buttered and salted popcorn. Still, folks can get, well, a little popped over the best ways to get corny. And please, don't even bother with the toxic stuff known as microwave popcorn. Here are eight other ideas for dressing up this crunchy classic. #(n1). [%image reference-image float=right width=350 credit="Photo © Culinate" caption="How do you like your popcorn?"]Home-popped. Explode those kernels — try a wok if you don't have an air popper — and then get funky with the toppings: nutritional yeast and chile flakes, black truffles and truffle oil, or gourmet finishing salts. #(n2). Cheesy. 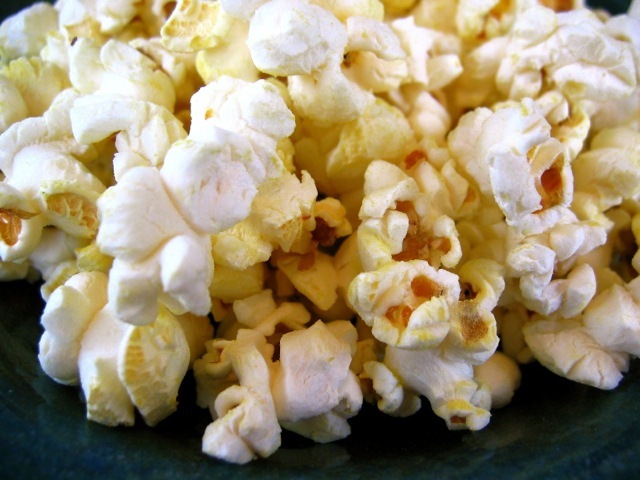 Grated cheddar cheese, blue cheese, Pecorino Romano, and Parmesan all play well with popcorn. Sprinkle as much or as little as you like over a bowl of warm popcorn to get the cheese to melt slightly. #(n3). Spicy. Sprinkle popcorn with dashes of chile powder, garlic powder, paprika, and cayenne pepper. For something more complex (or bizarre), try this Gourmet recipe featuring egg whites, miniature pretzels, and Worcestershire sauce. #(n4). Farm-style. Mix popcorn together with a few herbs and buttermilk for an addictive (but not too salty) treat. #(n5). Caramelized. The classic sweet treatment for popcorn. For extra fun, read David Lebovitz’s candid blog entry before you give his recipe for caramel popcorn a go. #(n6). Nostalgic. Make pink peppermint popcorn bars. Think of them as a brightly hued alternative to Rice Krispies Treats. #(n7). Appetizer. For a simple starter, pop up a batch of popcorn and serve it in bowls as a traditional pairing for ceviche. #(n8). Wet. Stretch the limits and use popcorn as a textured garnish for soup. How do you like your_ corn?